* Perform your every wish and desire. THIS NEW BOOK REVEALS THE SECRET CEREMONIES OF THE ANCIENT MAGICIANS WHO COULD MYSTERIOUSLY CONTROL EVENTS AND THE LIVES OF OTHERS. It reveals not only how to create a Magick Mentor but also how to cast the secret spells of Genuine magick to enable you to win horse racing bets; succeed in one's career; make someone love you; also powerful destructive magick for dealing with those who have wronged you. No less than 23 spells for attracting and keeping a lover given! The phenomenon of the 'Magick Mentor' is a real one. It is known by many names, 'thought forms', 'familiars', etc. Writers from different backgrounds and with no direct connection with one another have alluded to it: Basil Crouch, Geoff Gray-Cobb, James Cullinan, Ophiel have all recorded their experiences of the extraordinary gains to be made from creating a 'Mentor'. These writers have not hallucinated, and are not subject of their own self-suggestions. A MAGICK MENTOR CAN HAVE MORE POWER THAN YOU COULD EVER IMAGINE BECAUSE IT/SHE/HE EXISTS INDEPENDENTLY OF YOURSELF (ALTHOUGH IT RECEIVES ITS POWER FROM THE HIDDEN POWER OF YOUR SUPERCONSCIOUS MIND). A reason why we may sometimes fail in making magick solve our problems is that we ourselves are too close to those problems in order to solve them. We are too emotionally involved. ENLISTING A POWER OUTSIDE OF OURSELVES CAN RELEASE THE FORCES THAT WILL BANISH OUR DIFFICULTIES AND ACHIEVE OUR GOALS. Your Magick Mentor will do the work for you once it has been instructed. 'Welcome, my Mentor. I am at my wit's end and have no way of solving my problem. I am about to be evicted and have nowhere to go'. 'Fear not, for you have been chosen to be a channel through which may be heard the Voice of Truth. The problem shall now be taken from you forever'. At the time she could not understand this reply. But within a few months her life was to change forever from one of social security payments to one of riches and fame. IT MUST BE UNDERSTOOD THAT A MAGCIK MENTOR IS NOT AN EVIL, DEMONIC ENTITY OVER WHICH YOU HAVE NO CONTROL. The Magick Mentor is an extension of your astral self. It has a separate existence, BUT IT IS ULTIMATELY DEPENDENT ON YOU. And it will exist only for as long as you want it to. 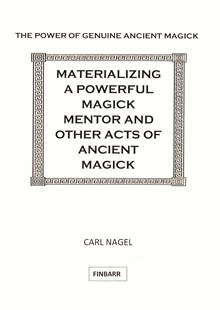 No amount of words is going to change the prejudices of those who insist that the Magick Mentor must be evil; and if you harbour such thoughts then you shouldn't buy this book. The reality is that your own Magick Mentor will be every bit as 'good' as you want it to be. * JOURNEYING INTO THE ASTRAL WORLDS. TRAVELLING INTO THE FUTURE. GOING BACK TO AGES PAST. * DISCOVERING THE SECRET INTENTIONS OF FRIENDS AND STRANGERS. * MAGICKALLY JOIN THE UNIVERSAL MYSTIC BROTHERHOOD; BE ONE OF THOSE WHO SECRETLY CONTROL EXTERNAL EVENTS FROM ACTIONS WITHIN THE INTERNAL WORLDS. * Joe, desperately shy, performed the Hagith Love Spell, and got the girl of his dreams within 7 days. * Warren became a successful writer with the help of the Och Success Rite. * Robert employed the powers of destructive magick to get even with a woman who had double-crossed him: the results were devastating! * Conway performed the Bethor Gambling Luck Ritual and won £1000 at the races. * Paul, unemployed, did the Spirit-Vision Ritual and saw the outcome of the following Saturday's horse race: the long shot came first and he made a killing! * How to ensure a Husband's loyalty.